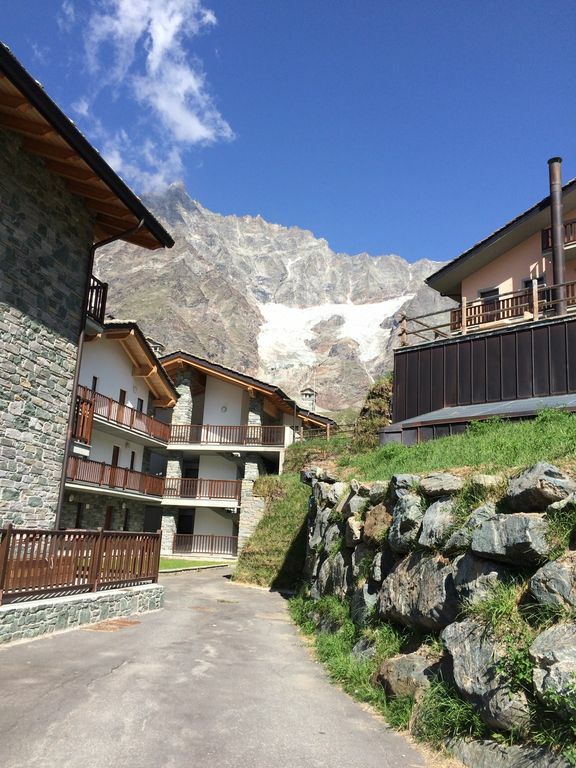 An den Hängen oberhalb Cervinia ist die Wohnung direkt neben dem Matterhorn und einige der neuesten Hotels in Cervinia platziert. Die Wohnung ist ganz neu mit neuen Möbeln und viel Platz (65 m2). 2 Schlafzimmer, 1 große Küche / Wohnzimmer. Außen Terasse mit Sonne am Nachmittag und Blick auf das Matterhorn. 4-6 Personen, obligatorische Reinigung und Wäsche / Bettwäsche, im Preis inbegriffen. Samstag bis Samstag - Kontakt Besitzer, wenn Sie möchten, dass andere Zeiten. Saubere und helle Wohnung in optimaler Lage für eine Ski-fahrende Familie in der besten Lage von Cervinia. Wir werden sicherlich nochmals zurückkehren. We had a lovely time in Cervinia, the apartment has 2 good size bedrooms and comfy living room. The balcony has a fabulous view of the Matterhorn. The apartment is very convenient for the slopes with just a short walk to the piste and then short ski down to the main lifts. Thanks to the 3 families for a great stay. Jes was always very quick answering any questions we had. We loved our stay at the three families apartment. It has all the things you need in the kitchen to cook up a meal, very comfortable beds and lounge area. It is spotlessly clean. It is in a perfect location to ski in and out onto No 3 piste. There are restaurants nearby, definitely treat yourself with a dinner at La Bricole! Jes is a great host. Very easy to contact and always answers straight away. So happy we found this gem for our holiday. The appartment is right on the slopes, very nice, modern,, with a well equiped kitchen, and is large enough for 5-6 people. The owners are very attentive. The view on the mountains is impressive. We had so much snow that it was climb-in climb-out rather than ski-in ski-out but that was an additional perk. Some very nice restaurants are nearby. It is worthwhile to pay good attention to the driving instructions (or follow directions to the hotel Principe delle Nevi, which is next door) in case you arrive in dense fog. The parking garage is large enough for a Volvo XC 90 with a ski box on the roof. All in all, very enjoyable, we certainly recommend this place. Well equipped apartment with plenty space and ski in/ski out. Comfortable lounge area and great balcony with view of Matterhorn and afternoon sunshine. Apartment is up the hill from town but it’s a 20 minute or so walk down the road. Bars and restaurants (plus other hotels/apartments) next to flat. Easy check in/check out and swift contact from owner for any questions. Cervinia itself is a great ski resort and the area pass into Zermatt results in a huge variety of skiing. All in all, good trip and would happily return again to Cervinia and to this apartment.